A few years ago, I moved to the North of England and spend the winter in a beautiful fairy tale, fisherman’s village called Whitby. It was one of the best times in my life which brought me also closer to the wonderful English baking tradition. My trips to Botham’s, the village bakery, were very frequent – it’s a must visit for everyone who loves and appreciates traditional craft bakeries. I still order my Shah Ginger Biscuits and bracks from there whenever I feel like a nostalgic taste of Whitby. 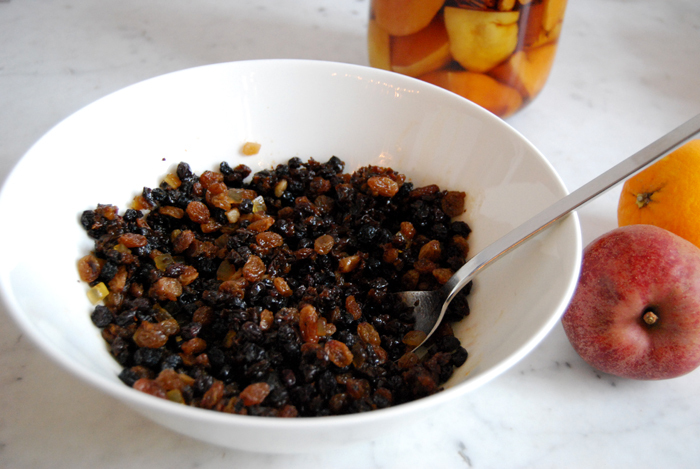 Today, it’s time for the famous English Christmas pudding as it’s my Stir-up Sunday! Traditionally, the pudding is made on the 25th Sunday after Trinity (I am a week late) and served and eaten on the 25th of December. The presentation is quite spectacular as it involves flambéing which guarantees excitement at the table. For the pudding you will need a 1.5 liter pudding basin with a lid. It is important that the fruit soak overnight before you get started and, traditionally, you mix silver coins into the pudding mixture as lucky charms. Mix the fruits together with the sugar and brandy and let them soak overnight. Butter the pudding basin well. 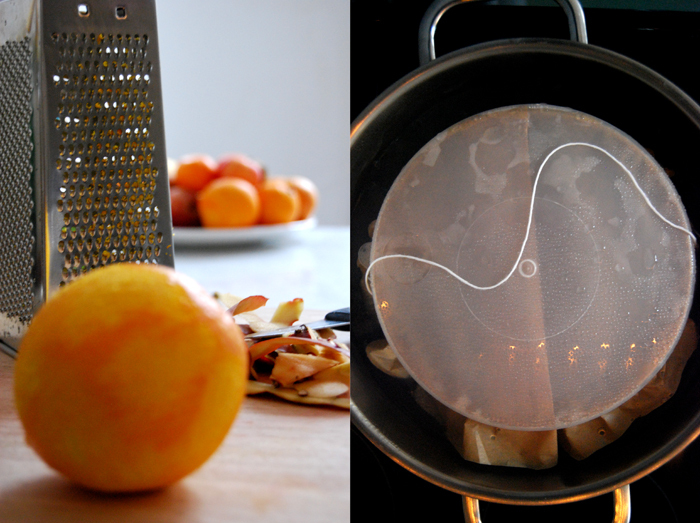 Prepare a parchment paper with a single pleat folded along the center from one side to the other. Fill a large pot with water, cover and bring the water to the boil. The pot should be big enough for the water to come up 2/3 of the pudding basin. In a large bowl, mix the vegetable shortening and eggs with an electric mixer. Add the apple, flour, bread crumbs, baking powder, spices and salt and mix until combined. Stir in the soaked fruits and fill the dough into the buttered pudding basin, cover the basin with the prepared parchment paper with the pleat right across and close with the lid. If you prefer, prepare a handle made of string like I did in the picture to be able to get the pudding basin out a bit easier. Put the pudding basin in the pot with the hot water, cover and cook for 3 1/2 hours (simmering). Let the pudding cool without opening the lid. 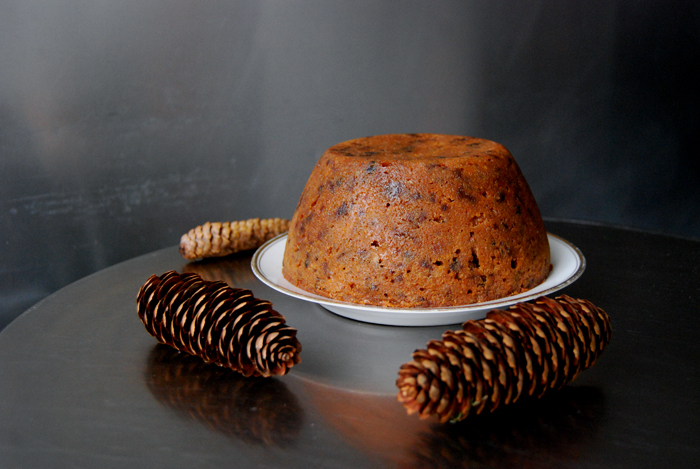 Remove the parchment paper, wrap the pudding in cling film and store in the closed pudding basin until Christmas. On Christmas day, repeat this procedure including the parchment paper with the pleat and cook for 3 1/2 hours again. Place the pudding on a plate. 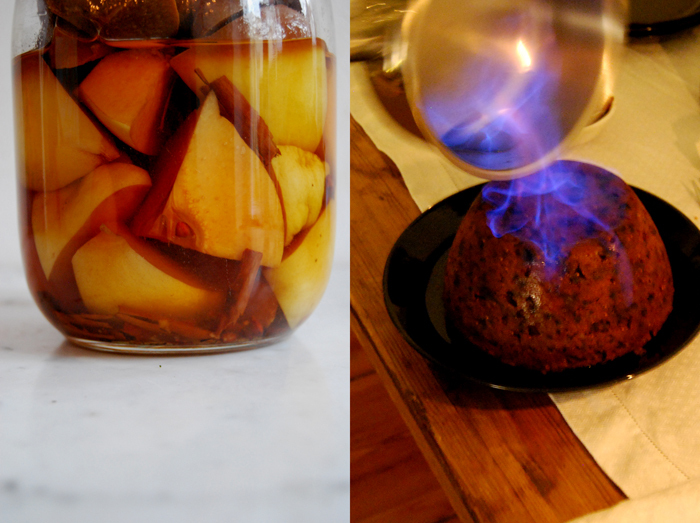 Pour the rum into a sauce pan, light it and pour over the pudding to present it in all its glory!